← How Far Away is the Milky Way’s Farthest Star? Image credit & copyright: European Southern Observatory (ESO)/Babak Tafreshi. Located 5,058 meters (16,597 ft.) high on the Chajnantor Plateau in Chile’s Atacama Desert (The driest desert in the world) sits the most powerful radio telescope as well as the most expensive ground based telescope ever created; the Atacama Large Millimeter/Sub-millimeter Array or “ALMA.” In short, this is an interferometer of 66 massive radio telescopes that work at millimeter and sub-millimeter wavelengths (0.32 to 3.6 mm). The entire array can be configured to operate from 150 meters (216.5 ft.) to a mind blowing 16 km (9.9 mi.) and has a resolving power 5 times finer than Hubble and 10 times finer than the Very Large Array (VLA) in New Mexico. It received its 66th antenna on September 30, 2013. Quickly, just because I know some may not know what interferometry is. In short, interferometry is a collection of different telescopes working together as one massive telescope to attain a higher resolution on a given object in the universe. Also, sub-millimeter astronomy is radio astronomy conducted at wavelengths longer than radio waves or generally put; microwaves. ALMA is a member of the European Southern Observatory (ESO) and is a collaboration between Europe, North America and East Asia as well as the Republic of Chile. Its main goal is to peer through material in molecular clouds to study and develop a better understanding of star forming regions to follow stellar evolution (birth through death), planetary systems, galaxies as well as the origins of life itself. It is currently the highest ground based observatory on Earth and its correlator supercomputer is the fastest ever used at an astronomical site. ALMA is also a member of the incredible Event Horizon Telescope (EHT) interferometer, which is a collection of telescopes across the world aimed at making a radio telescope the size of the Earth. Once the data is collected at their individual locations, it must be transported via “sneakernet” to MIT’s Haystack Observatory in Massachusetts and Bonn Germany’s, Max Planck Institute for Radio Astronomy. On site you will also find the Atacama Compact Array (ACA) which also goes by the name Morita Array. This is a subset of 16 radio telescopes (12-7 meter antennas and 4-12 meter antennas) designed to enhance ALMA’s widefield capability which helps to observe large angular size objects such as closer galaxies and molecular clouds. 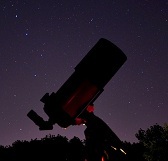 Image | This entry was posted in Astronomy (Learning), Astrophotography (Wide Field), Images, Telescopes & Detection Equip. 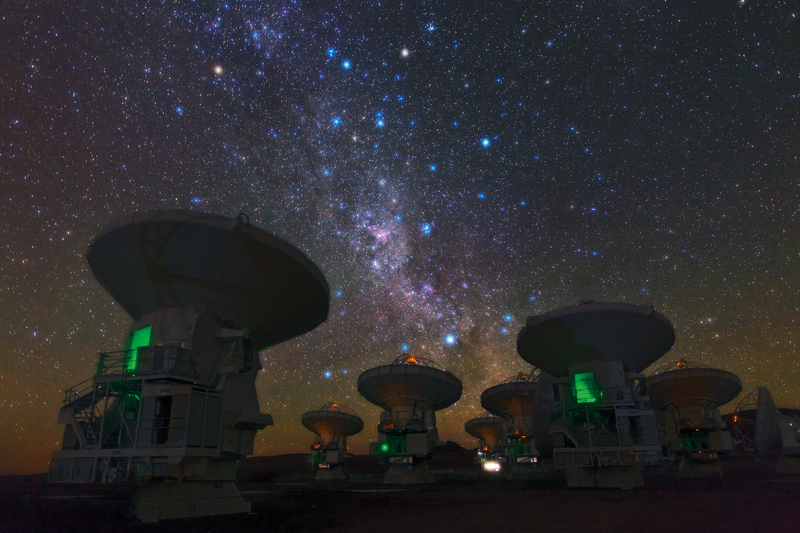 and tagged ALMA, Atacama Desert, Atacama Large Millimeter sub-millimeter Array, Babak Tafreshi, Chile, EHT, ESO, European Southern Observatory, Event Horizon Telescope, Radio Astronomy. Bookmark the permalink.